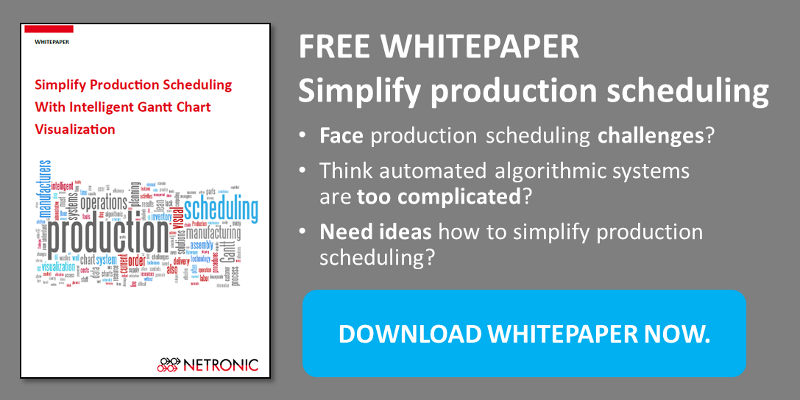 What Does "GPS" for Production Scheduling Mean? The GPS in our car is constantly working as it keeps calculating the expected arrival time at the destination from the current position and traffic situation. In case of traffic jams, alternative routes can be selected and all data get updated immediately. In case of the driver making a break, the position data are not altered but as the time keeps running, the arrival date gets postponed. Although the predicted arrival time is subject to uncertainties, it nevertheless provides valuable help for judging whether we'll reach our destination in time. If we are on our way to an external meeting, we will realize at an early stage whether we'll have to let the other members of the meeting know that we will be late. We are so used to this kind of assistance in our cars that we don't want to miss it any more. 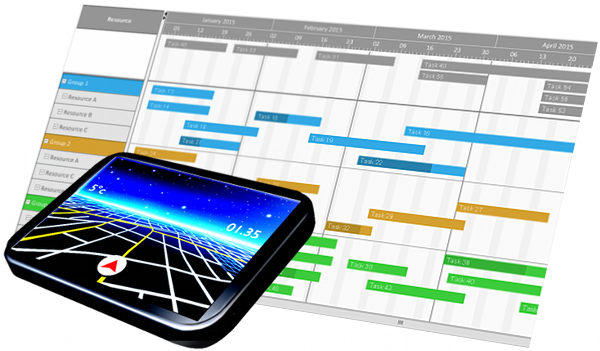 The meaning of a road map for the car GPS can be compared to the synchronous scheduling Gantt chart's meaning for production. The current time is the fixed benchmark while the Gantt section keeps moving forward according to the time course. The chart always shows us the currently valid production situation. Our roads are the resources, which we use according to their availability and capacity to complete a production order. Based on the selected planning strategy, the order of the operations per resource will be determined. In the production context, arrival time means the production order's completion date, i.e. the time of delivery. An unexpected resource failure calls for immediate rescheduling and the crucial question is whether it is still possible to keep the promised delivery date. As is the case with GPS, a predicted finish time is given. Often, production planners create their time schedules by using spreadsheet software. At the point of time when they do their planning excercise, all settings for the coming planning period (one week, usually) are made bindingly and then put into practice. After that a new plan is made for the following period. This carries the risk of not taking into account unplanned circumstances and incidents that may arise during the planning period. So, working with a fixed spreadsheet-based production plan is like driving a car without a GPS that automatically suggests a new route given the current traffic conditions. Without prompt corrections the unpredictabilities of planning will lead to a divergence between planning and reality. Critical points in planning are often inaccurate target specifications for processing times on the one hand and, on the other hand, the inevitable variance of the actual processing times. Furthermore, there are unpredictable events, such as sudden machine failure or illness of staff members. Though these events are known as event type they may nevertheless disrupt the planning because one never knows when they will happen. Even the customers can cause turbulences of the schedule by rush orders, quantity changes, and cancelations (in that context, please also have a look at the 4 facts why SMB manufactures need visual production scheduling). A plan is designed as orientation guide and signpost for the next steps to be taken. Generally speaking, the longer it takes to update a plan in a dynamical environment, the less reliable the plan will get. Only consolidating the planning can work against this. When moving to continuous planning, the planning period will shrink considerably, i.e., response and events are immediately included into the plan after they have become known. The planning period can include the complete order pool, but this is where spreadsheet software as universal planning tool reaches its limits because the effort needed for updating can't be handled on a manual basis any longer. The solution to this is provided by a practicable, synchronous Gantt chart: "The GPS for Production" which is kind of an assistance system, still leaving the desired decision-making authority and freedom with the production planner and helping them to quickly and accurately estimate the consequences of their decisions and the status changes in production. Such a synchronous planning board is used in an application especially designed for the textile manufacturer Dickies. Financial benefit for the company is not only gained by the transparency of the orders and machine utilization but also by permanently updating the planning data. Read about the Dickies case here. Would you like to learn more about how intelligent Gantt charts can improvde production planning? Download our free Whitepaper here.